Two Businesses of the Same Size. One Sells for Twice the Other. Why? Elements of the business’s condition, aside from its revenues and profits, may increase or decrease its potential value. Value Reducers and Enhancers are about risk. The more or less risk the buyer sees within the business, then the more or less the buyer may be willing to pay. 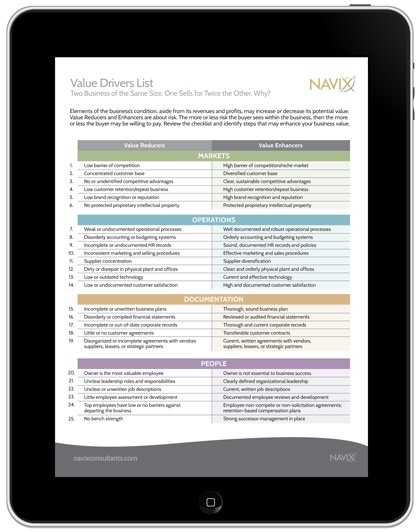 Review the checklist and identify steps that may enhance your business value.